A cable detector can locate open power cables, either live or without current, up to 300 V. A cable detector can locate cables, circuits, short circuits and ground wires. To perform these functions, it is not always necessary to disconnect electrically sensitive devices or to disconnect the power to the cable being tested. Many cable detector devices can also locate ferrous and non-ferrous metals, wood and plastic with high degrees of accuracy. A cable detector provides a safe way to test wall sockets for which no electrical plans or wiring information is available about the cables or their output. A cable detector is very versatile, as it ensures speed and safety when making holes in walls, ceilings and floors. This cable locating device is capable of finding underground cables and pipes laid to a depth of 7m, and determining their laying depth. Transmitter and receiver included. 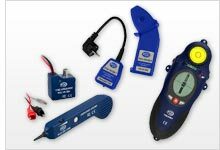 PCE-191 CB is a handheld, portable wire tracer, cable detector or cable fault meter used for locating wires and cables hidden behind walls and insulation. PCE-180 CBN is a handheld, portable, battery-powered wire tracer or cable locator that consists of an amplifier probe and acoustic signal or tone generator. This locating device is designed to detect wires or cables hidden behind walls or insulation. PCE-CL 10 is a cable detector that uses the conductive method to detect metal pipes or pipe tracer wires. With PCE-CL 10, you also can locate power cables, lines, circuits, short circuits and ground points, as well as test protective tubing and coaxial cables. To perform these functions, it is not necessary to disconnect the power. Location can be identified in floors, ceilings, walls and the ground, even behind concrete and brick. PCE-CL 20 is a cable detector or locator used to detect live and voltage-free electrical wires. This cable detector also can be used to locate metallic and non-metallic gas or water pipes, identify short circuits, and follow lines inside walls or under flooring.